BAGUIO CITY – Israeli Ambassador to the Philippines Rafael Harpaz assured Mayor Mauricio G. Domogan the Israeli government will extend technical assistance to the local government for the propagation of endemic tree species and water recycling to boost the city’s local tourism industry and to sustain its identity as one of the premier tourist destinations in the country. Harpaz, his wife Shulamit, and officials of the Israeli embassy, paid a courtesy call to Mayor Domogan Wednesday afternoon where possible partnerships on the promotion of the local tourism industry, the provision of technical assistance on water recycling, agriculture, among others, were discussed between the two officials aside from the healthy discussion on the rich culture and history of Israel and the Philippines. “We are deeply impressed with the friendly people, the good climate and the potentials for greater economic activities of Baguio City. We will extend whatever technical assistance the local government needs to improve its supply of potable water through various technologies and the propagation of endemic tree species that will help boost the city’s tourism industry,” Ambassador Harpaz told Mayor Domogan during the courtesy call. He disclosed Israel has available technologies on water recycling, desalination, among other applicable technologies, that can help improve the city’s agriculture sector thus boosting the sustained growth of the local tourism industry. According to him, some of the 30,000 Filipino caregivers working in Israel come from Baguio City and other parts of the Cordillera and their Israeli employers are impressed with the dedication and patience of these overseas Filipino workers in caring for the elderly, persons with disabilities and young children in their country. Harpaz likened Baguio City to Spot, a city in the northern part of Israel that has quite a similar weather condition and sceneries with that of the country’s undisputed Summer Capital. Domogan requested the Israeli ambassador to assist the local government in finding appropriate water recycling technologies to help treat the water discharged by the Baguio sewerage treatment plant into potable water for the domestic needs of residents and add up to the existing water sources of the Baguio Water District. Ambassador Harpaz assured the local chief executive of short, medium and long-term partnerships between the local government and the Israeli government for the adequate transfer of appropriate technologies that will contribute in local efforts to enhance the preservation and protection of the city’s environment and further improve the local tourism industry aside from providing additional sources of water to cater to the rapidly increasing water requirements of the city’s increasing population. 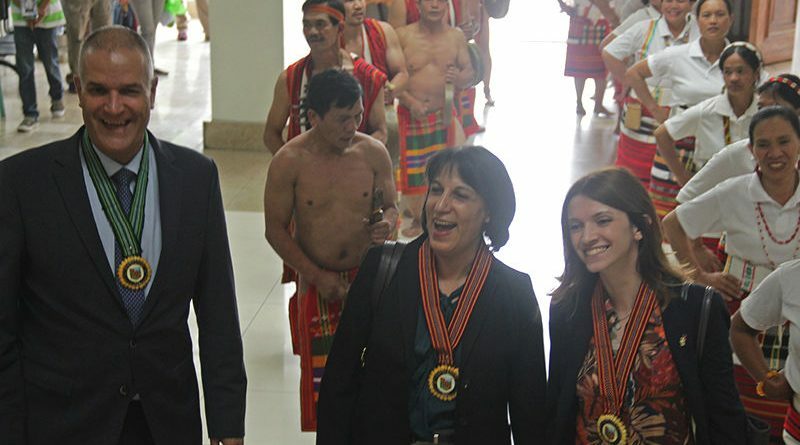 The Israeli envoy was elated to learn that Baguio was initially planned for only 25,000 people but its population significantly grew to 364,000 apart from the over 100,000 student population that lives with residents in the different barangays that were created.